The 11th YouTube Brandcast, the brand’s annual NewFront in May, was once again brought to life with the help of the MAS team. YouTube hosted 150 of its own content creators and an impressive 2,700 attendees at the Jacob Javits Center in New York City, where they demonstrated the power of the platform in connecting advertisers to highly engaged consumers alongside a continuously — and compelling — landscape of user and professionally generated content. As they walked the red carpet alongside the content creators, Brandcast attendees were greeted by 200 excited fans – fans hoping to catch a glimpse of the creators. The goal of this red carpet experience was to give advertisers a true sense of the YouTube audience and the brand’s impressive ability to cultivate content creators who have helped the platform become a world leader in online video distribution. Select guests were invited into an executive lounge where they could enjoy the show (and a cocktail) in a more intimate setting. 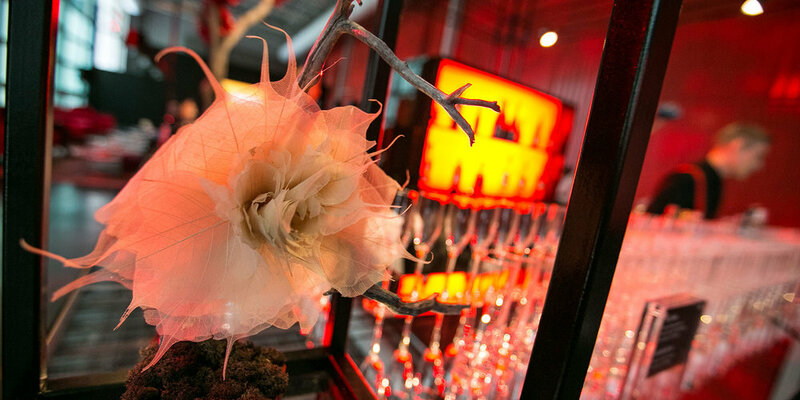 The space was meticulously designed with custom upholstered velvet seating, floral sculptures, and an architectural bar that acted as a visual anchor. A small performance area was created to accommodate an acoustic performance by the rising singer/songwriter Andra Day. After the show, all of the guests were ushered into an adjoining space where dinner and drinks were served in an unconventional, exploratory fashion. As a nod to the evening’s featured content creators, MAS designed three double-sided creator stations, each in the vein of a different YouTube Channel. Guests could drink wine with Laura Vitale, decorate cupcakes with Rosanna Pansino, and take photos in an oversized refrigerator with the Sorted Food crew. Guests were alerted that dinner was coming to a close when the statement wall’s seemingly decorative YouTube lozenge started to rise, revealing the main show area now transformed into an after-party space. Hoverboard dancers, DJs, a light-up bar, and a performance by Sia was more than enough encouragement to get guests dancing. The Google Marketing team came to MAS with a major product launch -- a nationwide tour to promote the newly released Google Home Mini. A smaller version of the already-on-market Google Home, the Mini connects you to the world using the voice-activated Google Assistant. 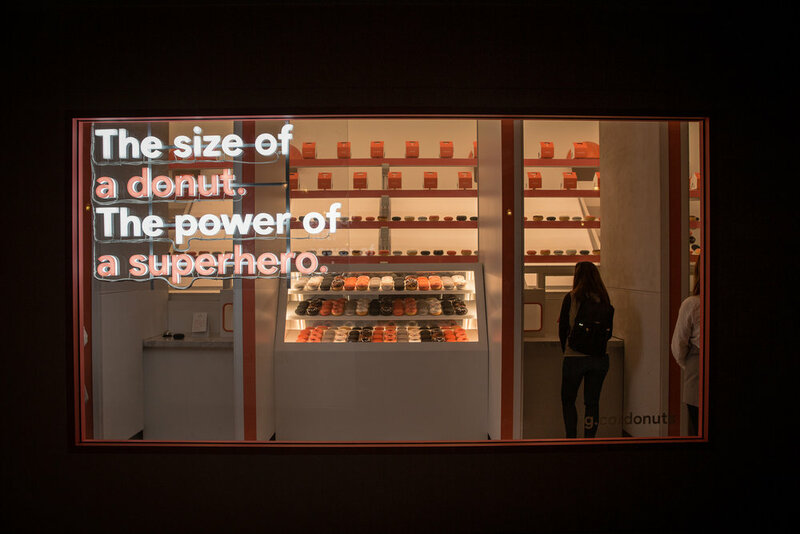 “The Size of a Donut, the Power of a Superhero” was the mantra developed by the Google team for this campaign. Through this launch event, MAS needed to unite this small but mighty device to the end user in a fun and memorable way. And so, the store and mobile experience was created, allowing consumers to interact directly with the Home Mini and thereby discover firsthand how this new device was designed to enhance and simplify their lives. 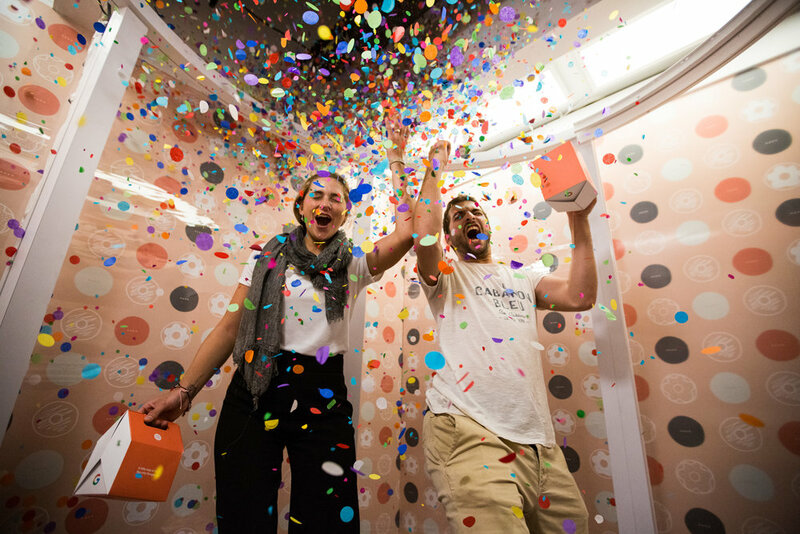 The Google Home Mini Donut Shop was the collaborative brainchild of Google’s Events and Experience Team, MAS Event + Design, and the interactive team at Deeplocal. MAS had to create an engaging environment in which each person could pose a question to the voice-activated Mini (“Hey Google, what does a rhinoceros sound like?”) and get a response. But not just a response. Everyone also got to take home a special treat that tied directly to the Mini’s mantra -- either a donut (from a renowned local gourmet bakery) or a superhero (an actual Google Home Mini device). Deep Local devised a system where the question triggered a conveyor belt to deliver a beautifully designed box to guests. The custom A-frame packaging, designed to look like a house, held either a device or a donut. 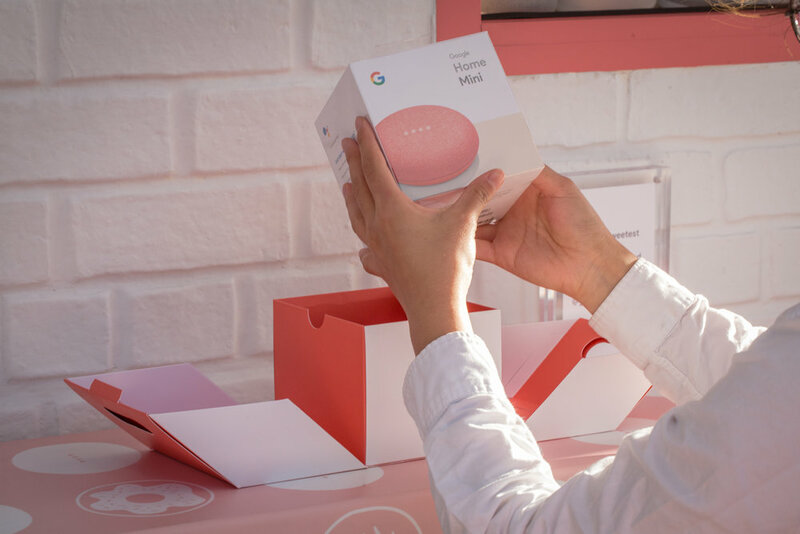 On October 4th, directly following Google’s annual product release press event, MAS launched a 12-city “Donut” tour, starting in San Francisco (mobile activation) and New York (a pop-up shop) and then moving into other markets. 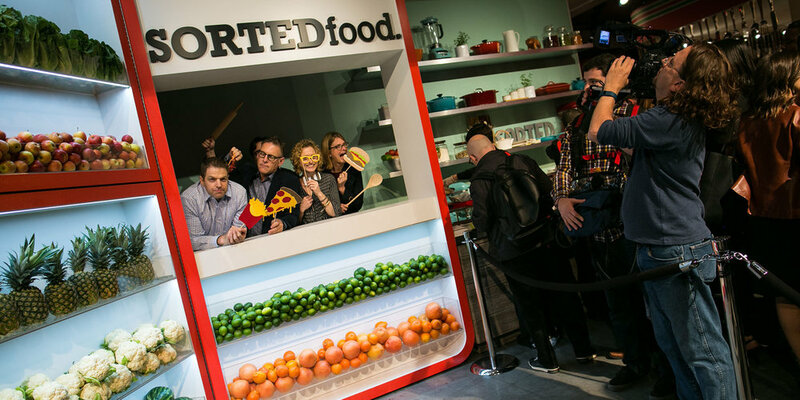 The tour involved three types of activations: a brick and mortar pop-up, a small VIP truck, and two 26-foot trucks that transformed into pretty patisseries. MAS traveled from Los Angeles to Brooklyn, from Toronto to Indianapolis, from San Francisco to Austin -- and many cities in between. The tour itself was scheduled to end in November but, due to popular demand, was extended through December. Nimbly responding to the new timeline, MAS adjusted the scenic build to highlight the holiday season, including a demo where customers could say “Hey Google, turn on my Christmas tree,” and the device would activate the lights of a ten-foot-tall Christmas tree. The activations were so successful that, on average, 200 people per day were already in line before the shop opened! To meet the high demand, a real-time inventory system was used to keep up with the number of devices and donuts being distributed. In total, 77,000 donuts were devoured and 22,000 Minis were given out. Overall the tour reached more than 51,000 people. The tour was popular on social media too, with 19 million impressions on facebook and 3 million on Twitter. The overall consensus: “This is the happiest place on earth!” Today, the donut project still marches on. These fancy fried treats made an appearance at the pre-Oscars benefit event, the CES Conference, and the Women’s Leadership Summit. 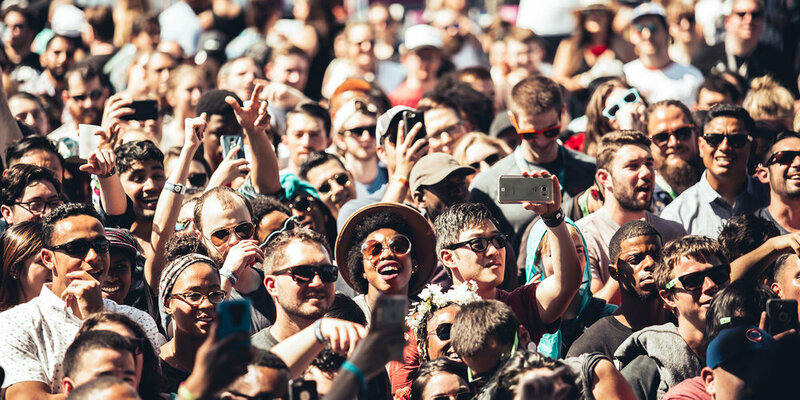 Austin’s favorite house party returned to SXSW 2016 with a big announcement — a change of address. 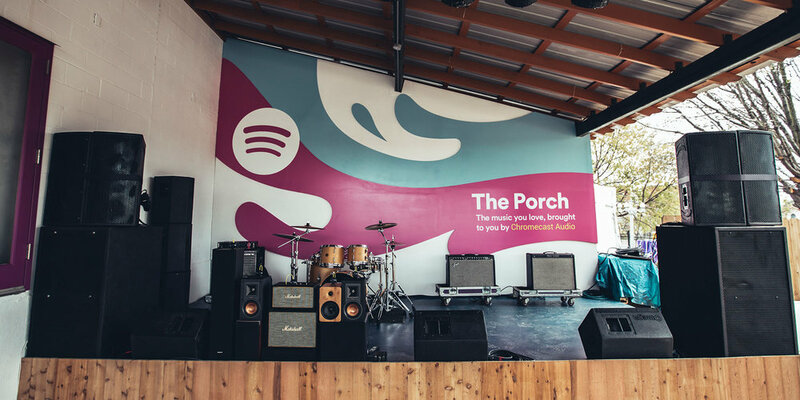 Formerly held inside an old transmission shop, the Spotify House moved into a once loved Mexican restaurant in the heart of Austin’s East side. 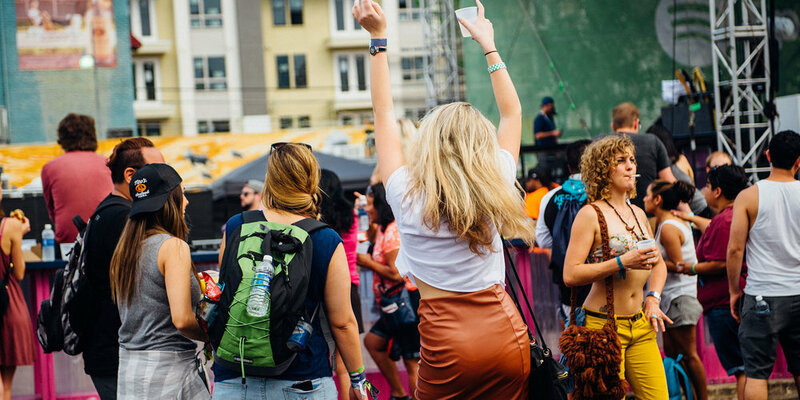 Not only was the new space much bigger and better able to accommodate the ever-growing level of interest from festival attendees, but it also offered a newly revamped brand experience with even more partner activations. MAS transformed the abandoned property, gutting the interior and replacing it with an interactive playpen that married music, technology, gaming, and film. Features of the new house included a Playstation arcade with interactive photo booth, a pop-up SoulCycle studio, an intimate performance area under a covered patio featuring Google’s Chromecast, a bigger and more modern cantina bar, and an all-new sound chamber listening station. For the Playstation arcade, MAS outfitted the space with both old-school arcade units and personal console stations where festival-goers had the chance to play pre-release versions of MLB The Show 2016 and Street Fighter V. Gamers not only got a first look at the highly anticipated games, but they were also able to create their own soundtrack as they played, using Spotify’s create-your-own playlist. Back by popular demand from the year before, SoulCycle enthusiasts were once again invited to start their day with a free ride in the house’s pop-up studio. Taking the experience a few steps further, the entire room was projection mapped with content during each ride that reflected the energy of riders’ output and the music, making this an immersive ride experience. DJs were invited to collaborate with SoulCycle instructors to create live soundtracks for each ride. 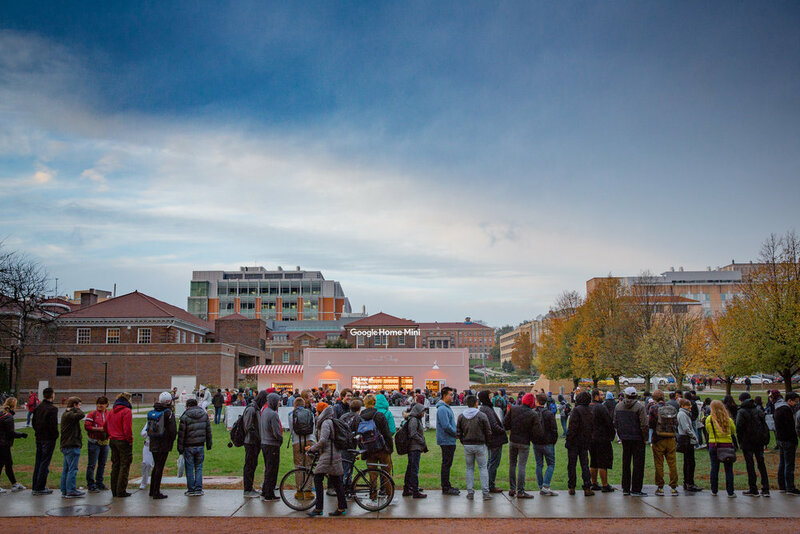 Throughout the five-day activation, 45 artists graced both stages, along with numerous DJs and other artists popping in to explore and experience the space. Despite the bigger footprint, the house was still packed to capacity every day! 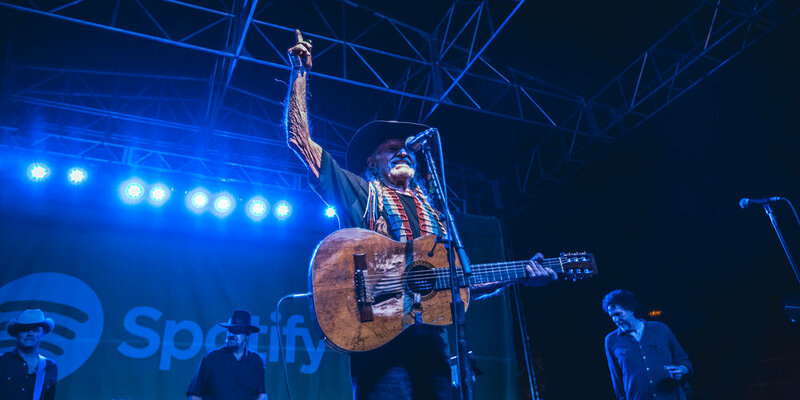 The highlight performance of the week was an exclusive show by the one and only Willie Nelson.